Nederlandse Spoorwegen (NS; Dutch: [ˌneːdərlɑntsə ˈspoːrʋeːɣə(n)] ( listen); English: "Dutch Railways") is a Dutch state-owned company, the principal passenger railway operator in the Netherlands. Founded in 1938, NS provides rail services on the Dutch main rail network (Dutch: hoofdrailnet). The Dutch rail network is the 7th busiest in the European Union, and 16th busiest in the world. The rail infrastructure is maintained by network manager ProRail, which was split off from NS in 2003. Freight services, formerly operated by NS Cargo, merged with the DB Schenker group in 2000. NS runs 4,800 scheduled domestic trains a day, serving 1.1 million passengers. Also, NS provides international rail services from the Netherlands to other European destinations and carries out concessions on some foreign rail markets through its subsidiary Abellio. Nederlandse Spoorwegen (NS) was founded in 1938 when the two largest Dutch railway companies, the Hollandsche IJzeren Spoorweg-Maatschappij (HSM) and the Maatschappij tot Exploitatie van Staatsspoorwegen (SS), formally merged. These two companies had already been intensively cooperating as early as 1917. There were both economic and ideological reasons for the cooperation. As a result of the First World War, the Dutch economy had declined causing HSM and SS to fall from profitability. Given their national importance, allowing them to slip into bankruptcy was not considered acceptable. While remaining independent companies, HSM and SS improved overall efficiency by cooperatively integrating their operations. The Government of the Netherlands further supported HSM and SS by purchasing shares in both firms. In 1938, the authorities merged the two companies to form the Nederlandse Spoorwegen. In the process, the Government of the Netherlands bought all remaining shares, yet never nationalised the company. Therefore, Nederlandse Spoorwegen remained, and still is owned by the Dutch Government. During the Second World War the NS remained an independent company, but was forced to do the Germans' bidding; NS was forced to construct the railway lines to camp Westerbork and help in the deportation of almost a hundred thousand Jews to extermination camps. The NS went on a strike once during the war, in the winter of 1944-45, after it had declined to participate in one a year earlier. The NS played a pivotal role in the reconstruction of the country. There was little alternative transport in the country besides the train, while there was a huge demand for logistical services which the NS could provide. While the 1950s were a good time for the company, it started to decline in the 1960s, like most other railways around the world. Not only did the NS suffer from the competition of the car and other modes of transport, but it also suffered from a loss of income when natural gas started to replace coal as the main fuel in power stations and homes after a gas field was found near Slochteren. The NS had been involved in the transport of coal from the mines in Limburg to the remainder of the country. The NS responded with an aggressive strategy named Spoorslag '70. This strategy meant, among other things, that the NS substantially increased the number of trains per hour and also introduced the Intercity services. However, it was quite clear that this would never return the company to profitability. Nevertheless, the company was declared to be of national importance, meaning that it would receive large amounts of subsidies every year. In the early 1990s, the Dutch Government started to question the subsidies given to the NS. Not only were there questions regarding the way the NS spent the subsidies, but, after the neoliberal reforms of the 1980s, it was also considered not done to award generic subsidies to companies. The authorities decided on the verzelfstandiging (corporatisation) of the NS although technically, this is not the case, but instead refers here to withdrawal of the subsidies. The idea was that not only rail transport was economically viable, but that there could be competition as well. There were two external circumstances which allowed for this to happen. Firstly, the European Union passed Directive 91/440, which prescribed, among other things, the formal separation of the national railways into two separate companies, one which deals with the infrastructure, and the other which deals with the transport activities. Secondly, the old CEO of the NS, Leo Ploeger, retired, which allowed the authorities to name a new CEO which would execute the government's plans. The new CEO was Rob den Besten. The plans entailed that the Government of the Netherlands would remain responsible for the rail infrastructure, while the NS would provide the passenger transport on a commercial basis. Where the services would prove to be economically inviable, the government would subsidize that route. The division which was responsible for the infrastructure would later be turned into NS Railinfratrust. To facilitate the Dutch Government's plans for the commercial operation of the NS, Den Besten planned to split the NS into many smaller independent divisions. The idea was that these smaller divisions would be better able to respond to the market. The plans, however, received massive opposition from the unions, which meant that the only divisions created were NS Reizigers, and locomotive maintenance company NedTrain. There were also other internal changes in the company. The route managers got de facto control over the operation, but they were dependent of a different organ in the company. The freight sector NS Cargo became part of the Deutsche Bahn after its merger with Railion in 2000 (later into DB Cargo). These reforms were never much of a success and left the company in an uncontrollable state. The result was that the company started to decline rapidly, and that the employees started many unorganised strikes. Following this, the complete board of directors felt it necessary to resign in late 2001. In 2002 Karel Noordzij was named as new CEO of the NS with the mission to restore the confidence in the company. In essence, he did this by reversing most the reforms of the late 90s and restoring the company to the old state. Meanwhile, the government had changed its opinion of the railways, it no longer considered competition on (passenger) transport a viable goal. Thus, the government started to commission railway operators to run routes on the network. The NS was granted (by the national government) the concession to run on the main lines, whereas other companies received a number of the concessions on the secondary lines. The goal is to give individual concessions for the individual lines, but (at least) until 2025 the NS holds the concessions for main lines. The timetable change on 10 December 2006 saw the most routes to approximate the symmetry time in clock-face schedules to the one used in most other European countries. Previously, this was different at minute (46 seconds) and led to problems by cross-border trains. In August 2015, former Minister of the Interior and Kingdom Relations Roger van Boxtel was named CEO of Nederlandse Spoorwegen. NS has been involved in various controversies. Technical problems with the high-speed Fyra (V250) trains, which started its services on 29 July 2012, and ended on 17 January 2013, led to the resignation of CEO Bert Meerstadt in June 2013 and to a parliamentary investigation in 2015. The High Speed Alliance (HSA), a daughter company of NS (90%) and KLM (10%) almost went broke due to the late introduction of the trains in combination with a too high price for the concession which the company paid to the Dutch government. HSA was liquidated in 2015. In 2013, it appeared that the NS used a daughter company in Ireland, "NS Financial Services Company", to evade taxes in the Netherlands. The procedure was determined to be lawful, but it was unfavorable for the Dutch taxpayers who do not believe that the Nederlandse Spoorwegen, which operates fixed trains in the Netherlands, can be Irish. From 1998 the NS used the favorable tax climate in Ireland, which resulted in a profit of more than €270 million. The corporate tax in Ireland was 12.5%, in the Netherlands 25% at that time. The Dutch company NS used the Irish daughter to buy new trains, among others the high-speed Fyra trains from the Italian firm Ansaldo Breda. The Dutch Minister of Finance, Jeroen Dijsselbloem, wrote to the parliament that NS would stop this tax evasion. In 2015 it became clear that a daughter company of the NS, Abellio, had shown unfair behavior with regard to a tendering for public transport in the province of Limburg. The company had obtained confidential information from a competitor, Veolia, through a former employee of Veolia who had been hired by the daughter company of Abellio, Qbuzz. On 5 June 2015, it became clear that CEO Timo Huges of the NS had given incomplete and incorrect information about the tendering procedure. According to Minister Dijsselbloem, Huges had acted "sloppy, inaccurate and in violation of the law." Consequently, Huges resigned from his position. The NS covers most of the country, with almost all cities connected, mostly with a service frequency of two trains an hour or more and at least four trains per hour between all of the largest 5 cities (Amsterdam, Rotterdam, The Hague, Utrecht and Eindhoven) as well as some smaller cities (Nijmegen, Amersfoort, Arnhem, 's-Hertogenbosch, Dordrecht and Leiden). From December 2008 train frequencies were increased on following services: Arnhem–Nijmegen (8 trains per hour) and The Hague–Rotterdam (12 trains per hour), Amsterdam Centraal–Hoofddorp (16 trains per hour). A night train service was added between Utrecht, Gouda and Rotterdam. Trains usually run between 5:00 a.m. and 1:00 a.m. although there is also a night line which connects major cities in the Randstad throughout the night, and in weekends also some major cities in North Brabant. In addition to its domestic services, NS is also a partner (along with Stena Line and their British railway company Greater Anglia) in the Dutchflyer service. NS has also entered into a partnership with KLM to operate services on the new HSL-Zuid under the name Intercity Direct towards Breda and Brussels. Intercity Direct is part of NS International; other services such as Thalys to France and Intercity-Express to Germany and Switzerland are also part of NS International. The hoofdrailnet is the official core internal passenger railnetwork of the Netherlands. Currently NS has a concession until 1 January 2015 to provide all passenger services on this network, except that on some stretches there is an overlap with lines for which other operators have a concession. Some of the most notable of these stretches are those from Elst railway station to Arnhem Centraal railway station, where NS shares tracks with Arriva, and further on to Arnhem Velperpoort. Here the tracks are shared by three operators, as Breng, ultimately part of Transdev, operates there in addition to the two previously mentioned operators. Officially the overlaps do not constitute competition on the same lines. The concession was free of charge until 2009, and costs an increasing amount since then, up to €30 million for the year 2014. The concession distinguishes main stations and other stations. Except on New Year's Eve, the main stations have to be served at least twice an hour per direction from 6 a.m. to midnight and the other stations at least once an hour. Exceptions are possible until the start of the next concession. The next concession period is 2025–2035. For the 2015–2025 concession, requirements include: for every train service where on average more than one-third of the passengers travel longer than 30 minutes, a train with a toilet is used, every newly ordered train has a toilet and in 2025 every train has to have a toilet. Currently trains on the hoofdrailnet without a toilet include the NS SGMm numbers 2111 to 2125, the so-called classical "Sprinter" and the Sprinter Lighttrain. A Sprinter stops at all stations, and is mainly used for local traffic. On some smaller lines, though, it is the only kind of service. The name is derived from the 'Sprinter' (2900 class) rolling stock; however, the service was sometimes operated using older style rolling stock (such as 'Plan V/T': 400, 500, 800 and 900 class). Intercity services only stop at larger stations, and were introduced in the 1970s to provide fast train connections throughout the country. As was with the former popular Sneltrein service, Intercity services are usually operated by DD-IRM and ICM/Koploper class trains. On some stretches, Intercity trains stop at all stations, including small ones, on Alkmaar - Den Helder, Bergen op Zoom - Flushing, Hoorn - Enkhuizen, Leiden - Woerden, and Deurne - Venlo. The label "Intercity" indicates that the train does not stop at all stations elsewhere on its route. See also Intercity services in the Netherlands and the list of Dutch stations served by Intercitys [nl] (in Dutch). NS also offers the Intercity Direct service, which offers faster service between Amsterdam Centraal and Breda as it only calls at four stations (Amsterdam Centraal, Schiphol, Roterdam Centraal, and Breda). Unlike other Intercity trains, the Intercity Direct requires payment of a supplement on top of the regular fare (€2.40) if a passenger's journey involves Schiphol and Rotterdam Centraal. Stoptrein: This is the original name for Sprinter trains. Between 2003 and 2013 NS discharged the Stoptrein formula in favour of Sprinter. Private operators do not use Sprinter so all private services in the Netherlands (except of the four Sneltreins of Arriva, see below) are Stoptrein. Sneltrein: Sneltrein (in the English section of the old paper time tables, they were translated as "semi fast train" and were a class between Stoptrain and Intercity) was abandoned by NS in 2008. The NS Sneltrein services are now called Intercity, but they stop more often than "real" Intercities. The result is that some stations (like Woerden) are served by some Intercities while others pass it. As of 2015, there are four Sneltrein services by Arriva. A NS Dagretour (one-time chip card), from Rijssen to Almelo and back. The OV-chipkaart is the common form of fare payment. Single or return tickets, used by incidental travellers and tourists, are available at ticket machines and service counters. They are a disposable use-once only. It is possible to buy e-tickets online on the Dutch Railways website. E-tickets can also be purchased on the Belgian NMBS/SNCB B-Europe website. For long term use season tickets are available. Travelling with these cards and tickets, one has to register starting a journey (check in) and ending it (check out) at the destination. One always has to travel away from the point of one's latest check-in. Thus, in the case of a voluntary detour, one has to check out and check in to register starting a new journey. Travellers need to be aware of the various companies other than the Nederlandse Spoorwegen. One needs to check out with one company and check in with another on some stations. There is common tariff system with four smaller passenger train operating companies: Keolis Nederland and Connexxion in the centre and the east, Veolia on the 'Maaslijn' and 'Heuvellandlijn' in the south east, Arriva in the north and most of the east of the country and on the 'Merwede-Lingelijn' (from Dordrecht to Geldermalsen). The OV-chipkaart is also used on buses and trams, where hourly tickets are for sale for those who have too little credit to travel but enough cash. NS defines off-peak hours as weekdays 09:00-16:00 and 18:30-06:30, and on Saturdays and Sundays the whole day. Therefore full fare is required on weekdays 06:30-09:00 and 16:00-18:30. With an OV-chipkaart that allows for a discount or free travel one is automatically granted the discount or free travel at the time of checking in. There is a number of season tickets available that suit individual preferences. The NS corporate logo was designed in 1968 by Gert Dumbar and Gert-Jan Leuvelink both of the graphic design company Tel Design. Introduced in that same year, it replaced an earlier design which had been used since 1946. The logo, pervasive within trains and railway stations in the Netherlands, plays a significant part in Nederlandse Spoorwegen's signage, promotions, advertising and graphic design. The logo usually appears in blue or black on a dark yellow or white background. Since its introduction, NS livery has also had this same distinct dark yellow or white colour. The logo is a widened letter 'N' and a sideways (reversed) 'S'-shape. The two arrows in the logo represent the train's movement, and the two lines in the middle represent the track. Abellio is the subsidiary for operations outside the Netherlands. Abellio has won several franchises in the United Kingdom and Germany. In February 2012, Greater Anglia commenced operating the Greater Anglia franchise, and in April 2015, Abellio ScotRail commenced operating the ScotRail franchise. In 2016, Abellio successfully bid to retain the renamed East Anglia franchise until 2025. Abellio has partnered with Mitsui for both the East Anglia and the West Midlands franchises, the latter also with JR East. In May 2009, the Travel London bus business was purchased from National Express and rebranded as Abellio London. NS Stations - in charge of the operation of all 404 railway stations in the Netherlands, i.e., also those served by other railway companies than NS Reizigers; see also station facilities. NS International - operator, in conjunction with NS Reizigers and foreign partners, of high-speed international Fyra services on the HSL-Zuid, Thalys (from Amsterdam to Paris), ICE (to the German Ruhr area), Intercities (to Berlin and Brussels) and the Swiss CityNightLine (to Munich and Zurich). On 23 July 2010 NS sold its daughter company Strukton to the construction company Oranjewoud N.V.. This concluded a long history of planning, designing and executing track development done by the NS. There is a delay refund scheme entitling passengers to a partial or full refund of the ticket price if a journey is delayed by half an hour or more. The scheme does not apply on short-distance journeys (tickets less than €2.30) and cases in which the delay is the result of planned cancellations that were announced some days in advance. Refunds are, in general, half the ticket price of a one-way trip after a delay of over 30 minutes, the full ticket price after a delay of one hour or more. That applies to nearly all kinds of tickets. The refund is not considered a monetary compensation for lost time but rather as a reduction in charges where a poor service has been provided. The system has improved for holders of some rail passes. Part of the cost of the scheme is paid by ProRail, since they are responsible for part of the delays. Since 1 January 2004, tobacco smoking is prohibited on domestic trains, station halls and covered parts of platforms. The smoking of cannabis was already prohibited. Smoking is allowed near smoking-zones (Rookzones), posts with an ash-tray built in, scattered around stations. Conductors have a small computer called Railpocket with timetable, fares information, and capabilities to read the OV-chipkaart. ^ "Van Boxtel nieuwe topman van NS". De Volkskrant. Retrieved 23 September 2016. ^ , International Union of Railways Annual Report, 2015. ^ "Annual report 2010". Nederlandse Spoorwegen. 1 January 2011. Archived from the original on 30 June 2011. Retrieved 18 July 2011. ^ DB and NS sign freight merger, Railway Gazette, 1 August 1999. ^ "NS-topman Bert Meerstadt stapt op". Archived from the original on 25 June 2015. Retrieved 5 June 2015. ^ "NS stopt met fiscale truc: treinen niet langer gekocht door Ierse dochter". Retrieved 5 June 2015. 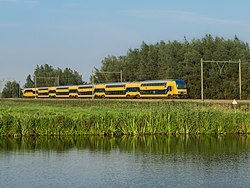 ^ "NS doet nog steeds zaken via de Ierse route". NRC Q. Retrieved 5 June 2015. ^ "Limburg gunt concessie openbaar vervoer aan Arriva". Retrieved 5 June 2015. ^ "Nog meer problemen voor ex-NS-topman Timo Huges". Retrieved 19 June 2015. ^ "'NS-topman Timo Huges stapt op wegens mogelijk machtsmisbruik'". Retrieved 5 June 2015. ^ "Nieuws". ns.nl. Retrieved 23 September 2016. ^ "OV-chipkaart (for tourists)". Trans Link Systems B.V. Retrieved 21 April 2018. ^ "NS agrees to sell Strukton". Railway Gazette International. 29 July 2010. Retrieved 24 March 2012. ^ Oranjewoud N.V., the holding company that owns Strukton. Johnston, Howard (18–31 May 1989). "A brief guide to the NS". Rail Magazine. No. 96. EMAP National Publications. NS 150 special supplement. ISSN 0953-4563. OCLC 49953699. "NS Annual Report 2017" (PDF). Annual Report in English. Retrieved 26 September 2018.